This article is about the 2017 novel. For the novel's 2018 film adaptation, see The Hate U Give (film). The Hate U Give is a young adult novel by Angie Thomas. It follows events in the life of a 16-year-old black girl, Starr Carter, who is drawn to activism after she witnesses the police shooting of a childhood friend. Published on February 28, 2017 by Balzer + Bray, The Hate U Give debuted at number one on The New York Times young adult best-seller list, where it remained for 50 weeks. It received positive reviews and won several awards. It is Thomas' debut novel, expanded from a short story she wrote in college following the police shooting of Oscar Grant. Shaken by the 2009 police shooting of Oscar Grant, then-college student Angie Thomas initially developed the project as a short story for her senior project in Belhaven University’s creative writing program. While writing the short story, the project quickly expanded, though Thomas temporarily put it aside after graduation; speaking to her hometown newspaper, Thomas said, "I wanted to make sure I approached it not just in anger, but with love even". But the deaths of Trayvon Martin, Mike Brown, Tamir Rice, and Sandra Bland drew Thomas back to expand the project into a novel, which she titled after Tupac Shakur's "THUG LIFE" concept: "The Hate U Give Little Infants Fucks Everybody." Incidents surrounding the killings of Alton Sterling, Philando Castile and Michael Brown and widespread ensuing protests against racism and police brutality also informed moments in the book. Unsure whether publishers would be interested in the Black Lives Matter-inspired material, Thomas reached out to literary agent Brooks Sherman on Twitter in June 2015 to ask for advice. In February 2016, HarperCollins imprint Balzer + Bray bought the rights to the novel in an auction, outbidding 13 other publishing houses , and signing a two-book deal with Thomas. Then, Fox 2000 optioned the film rights the following month. The 464-page book was published on February 28, 2017. The audiobook was released on the same day and featured narration by Bahni Turpin, whom Thomas selected to read the book. Starr Carter is a 16-year-old African American girl who lives in the fictional, mostly poor black neighborhood of Garden Heights, but attends an affluent, predominantly white private school, Williamson Prep. After the police break up a party Starr is attending one weekend, Starr is driven home by her childhood best friend, Khalil. On the way home, they are stopped by a white police officer. The officer has Khalil, who is also African-American, exit the car; while outside the car, Khalil leans into the window of the driver-side door to check in on Starr. The officer fires three shots into Khalil, killing him. Khalil's death becomes a major national news story. The media portrays Khalil as a gang banger and drug dealer, while more favorably portraying the white officer who killed him. Starr's identity as the witness is initially kept secret from just about everyone outside Starr's family, even her younger brother Sekani – leaving Starr's two best friends, Hailey Grant and Maya Yang, and Starr's white boyfriend, Chris, who all attend Williamson Prep together, all unaware of Starr's connection to the news story. Having to keep this secret weighs on Starr, as does her need to keep her Williamson and Garden Heights personas separate. Starr's struggles with her identity are further complicated after her mother Lisa leaves her job as a nurse in a Garden Heights clinic for a high-paying hospital job and the family moves out of the neighborhood. Starr agrees to be interviewed by two detectives about the shooting after being encouraged by her Uncle Carlos, who is also a detective. Carlos was a father figure to Starr when her father, Maverick, spent three years in prison for gang activity. Following his release, Maverick leaves the gang and becomes the owner of the Garden Heights grocery store where Starr and her half-brother Seven work. Maverick was only allowed to leave his gang, the King Lords because he admitted to a crime even though he was innocent; this kept gang leader King from being locked up. King, widely feared in the neighborhood, now lives with Seven's mother, Seven's half-sister Kenya, who is friends with Starr, and Kenya’s little sister, Lyric. After a grand jury fails to indict the white officer, Garden Heights erupts into both peaceful protests and riots. The failure of the criminal justice system to hold the officer accountable pushes Starr to take an increasingly public role, first giving an interview and then speaking out during the protests, which are met by police in riot gear. Her increasing identification with the people of Garden Heights causes tension with Starr's friends and especially with her boyfriend Chris. By the end of the novel, Starr and Maya have started standing up to Hailey's racist comments and Chris remains supportive of Starr. The climax of the novel occurs during the riot following the grand jury results. Starr, Chris, Seven, and DeVante, a member of the King Lords who Maverick helps to escape the gang by having DeVante live with Carlos, successfully defend Maverick's store from King. The neighborhood stands up to King and thanks to testimony by DeVante, King is arrested and expected to be imprisoned for a long time. Starr promises to keep Khalil's memory alive and to continue her advocacy against injustice. The book debuted at the top of The New York Times young adult (YA) best-seller list, which it would eventually be on for more than 80 weeks. The book had 100,000 copies in print in the first month, eventually selling more than 850,000 copies as of June 2018[update]. The book was popular with readers, winning Goodreads annual awards vote in the categories of Best Young Adult Fiction and Debut Author. Critics also widely praised the book. In The Globe and Mail, Shannon Ozirny wrote, "Ignore the YA label – this should be the one book everyone reads this year." In Salon, Erin Keane said the novel is "topical, urgent, necessary, and if that weren’t enough, it’s also a highly entertaining and engaging read." In the Christian Science Monitor, Katie Ward Beim-Esche wrote, "Believe the hype: The Hate U Give, Angie Thomas’s extraordinary and fearless debut, really is that good." The book also earned starred reviews by several review journals including Booklist, Bulletin of the Center for Children's Books, Horn Book Magazine, Kirkus, School Library Journal, and VOYA. After the number of children's books by black authors had remained unchanged for nearly a decade, the book was published at a time the industry was attempting to address that stagnation. Since its publication, Thomas has become a representative of attempts by publishers to have more young adult African American novelists. The book has not been without controversy. The American Library Association listed it as one of the 10 most challenged books of 2017, "because it was considered 'pervasively vulgar' and because of drug use, profanity, and offensive language." In July 2018, a South Carolina police union raised objections to the inclusion of the book, as well as the similarly-themed All American Boys by Brendan Kiely and Jason Reynolds, in the summer reading list for ninth-grade students of Wando High School. A representative of the police lodge described the inclusion of the books as "almost indoctrination of distrust of police" and asserted that "we’ve got to put a stop to that." The books remained on the list and Wando's principal would later be recognized by the state school library association for her defense of the challenged books. The book was removed from the school libraries of the Katy Independent School District due to the book's explicit language. Thomas responded to these challenges by defending its message and saying the book is a spur for conversation. The book was recognized in 2018 by the American Library Association with the William C. Morris Award for best debut book for teens, the Odyssey Award for best children's audiobook, the Coretta Scott King Award for the best novel by an African American author for children, and the Michael L. Printz Award for best novel for teens. The novel also won the overall Waterstones Children's Book Prize and American Bookseller's Association Indie Award for Best Young Adult Novel. 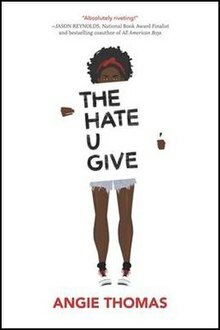 The Hate U Give was named to the National Book Awards longlist for young adult literature and was nominated for 2018 Carnegie Medal (literary award), and won the 2018 Deutscher Jugendliteraturpreis in the "young adult jury" section.. The book also won the CILIP Amnesty Award in 2018 for best-displaying and celebrating our human rights. Fox 2000 optioned The Hate U Give for a film adaption in March 2016, shortly after the book's auction. George Tillman Jr. and Amandla Stenberg were immediately attached to the project (to direct and act, respectively). The movie also features Issa Rae, Regina Hall, Russell Hornsby, Algee Smith, KJ Apa, Lamar Johnson, Common, and Sabrina Carpenter based on a screenplay by Audrey Wells who died one day before it was released. The movie was given a limited release on October 5, 2018 and wide release on October 19, 2018. The movie was generally favorably received with a Rotten Tomatoes critics score of 8.2/10 and an A+ CinemaScore, as of March 2018[update], the film had a worldwide box office gross of 34 million dollars against a budget of 23 million dollars. ^ Anderson, Tre'vell (August 30, 2018). "How the deaths of Oscar Grant and Trayvon Martin inspired 'The Hate U Give'". Los Angeles Times. Retrieved September 7, 2018. ^ a b Ozirny, Shannon (March 24, 2017). "Angie Thomas's The Hate U Give, Vicki Grant's Short for Chameleon and Nina LaCour's We Are Okay, reviewed". The Globe and Mail. Retrieved March 26, 2017. ^ a b c "Angie Thomas." Contemporary Black Biography, vol. 148, Gale, 2018. Biography in Context. Accessed September 4, 2018. ^ a b Philyaw, Deesha (March 14, 2017). "One-on-One with 'The Hate U Give' Novelist Angie Thomas". Ebony. Retrieved March 25, 2017. ^ Ohikuare, Judith (March 2, 2017). "How Tupac's THUG LIFE Inspired This Woman's YA Novel". Cosmopolitan. Retrieved March 26, 2017. ^ a b "Angie Thomas on the Hate U Give." Horn Book Magazine, vol. 93, no. 2, Mar/Apr2017, p. 97. EBSCOhost. ^ a b c "The Hate U Give" (December 2017). Kirkus Reviews. Retrieved September 4, 2018. ^ Yandoli, Krystie Lee (October 21, 2018). "Angie Thomas, The Author Of "The Hate U Give," Has A Message For Young People". BuzzFeed News. Retrieved March 29, 2019. ^ Kirch, Claire (February 25, 2016). "Balzer + Bray Prevails in 13-House Auction for YA Debut". Publishers Weekly. Retrieved March 26, 2017. ^ a b c d Alter, Alexandra (March 19, 2017). "New Crop of Young Adult Novels Explores Race and Police Brutality". The New York Times. Retrieved March 26, 2017. ^ BURKEY, MARY. "The Booklist Odyssey Interview." Booklist, vol. 114, no. 15, January 4, 2018, pp. 86-87. EBSCOhost. ^ a b c Canfield, David (September 16, 2018). "'The Hate U Give' author Angie Thomas on why it's wrong to ban her Black Lives Matter novel". EW.com. Retrieved March 29, 2019. ^ Kantor, Emma (June 26, 2018). "Children's Institute 2018: Angie Thomas Urges Booksellers to 'Change the World". www.publishersweekly.com. Retrieved February 1, 2019. ^ Woodsbury, Jessica (December 5, 2017). "ANNOUNCING THE WINNERS OF THE 2017 GOODREADS CHOICE AWARDS". Bookriot. Retrieved August 28, 2018. ^ Keane, Erin (March 4, 2017). ""The Hate U Give": Angie Thomas' sensational debut novel should be required reading for clueless white people". Salon. Retrieved March 25, 2017. ^ Beim-Esche, Katie Ward (March 1, 2017). "'The Hate U Give' provides a window into conversations about race". Christian Science Monitor. Retrieved March 26, 2017. ^ Cart, Michael (December 15, 2016). "The Hate U Give". Booklist. Retrieved September 4, 2018. ^ Stevenson, Deborah (2017). "The Hate U Give". Review. Bulletin of the Center for Children's Books. 70 (7): 297–298. doi:10.1353/bcc.2017.0159. ^ Dar, Mahnaz (January 26, 2017). "The Hate U Give". School Library Journal. Retrieved September 4, 2018. ^ "The Hate U Give". VOYA. February 2017. ^ "The top 10 books parents wanted banned from libraries in 2017". Billings Gazette. April 10, 2018. Retrieved August 28, 2018. ^ Flood, Alison (July 4, 2018). "South Carolina police object to high-school reading list". The Guardian. Retrieved March 29, 2019. ^ Staff, S. L. J. "Book Banning Legislation in Florida, Resolution To Stop Teaching". School Library Journal. Retrieved April 13, 2019. ^ Carr, Mary Kate (February 12, 2008). "Hello, Universe, We Are Okay among American Library Association 2018 young media award winners". Entertainment Weekly. Retrieved August 28, 2018. ^ Eyre, Charlotte (March 22, 2018). "Angie Thomas wins Waterstones Children's Book Prize". Bookseller. Retrieved August 28, 2018. ^ "Impromptu." Horn Book Magazine, vol. 94, no. 4, Jul/Aug2018, pp. 145-147. EBSCOhost. ^ Kellog, Carolyn (September 12, 2017). "The 10 books in the running for the National Book Award for young people's literature". Los Angeles Times. Retrieved August 28, 2018. ^ Flood, Alison (March 15, 2018). "Patrick Ness could land first ever Carnegie medal hat-trick". the Guardian. Retrieved October 16, 2018. ^ "Sechs Nominierungen für Gerstenberg". Boersenblatt. March 15, 2018. Retrieved August 28, 2018. ^ "The CILIP Carnegie and Kate Greenaway Awards". Carnegie Greenaway. Retrieved March 29, 2019. ^ "‘Insecure’ Star Issa Rae Joins Drama ‘The Hate U Give’". Variety, August 23, 2017. ^ Ford, Rebecca (August 24, 2017). "Sabrina Carpenter Joins YA Adaptation 'The Hate U Give' (Exclusive)". The Hollywood Reporter. Retrieved September 12, 2017. ^ Kreps, Daniel (October 6, 2018). "'The Hate U Give' Screenwriter Audrey Wells Dies Day Before Film's Release". Rolling Stone. Retrieved October 6, 2018. ^ "The Hate U Give (2018)". Box Office Mojo. Retrieved September 21, 2018. ^ Ramos, Dino-Ray (May 23, 2018). "Fox 2000 Sets Release Date For 'The Hate U Give'". Deadline. Retrieved August 28, 2018. ^ "The Hate U Give". Rotten Tomatoes. Retrieved October 20, 2018. ^ Sperling, Nicole (October 22, 2018). "Can The Hate U Give Make Its Own Word-of-Mouth Wave?". HWD. Retrieved October 24, 2018. ^ "The Hate U Give (2018) - Box Office Mojo". www.boxofficemojo.com. Retrieved January 2, 2019.